A man has been filmed on the phone to police while sprawled across the bonnet of his own Mercedes, which had been taken by his ex-girlfriend. 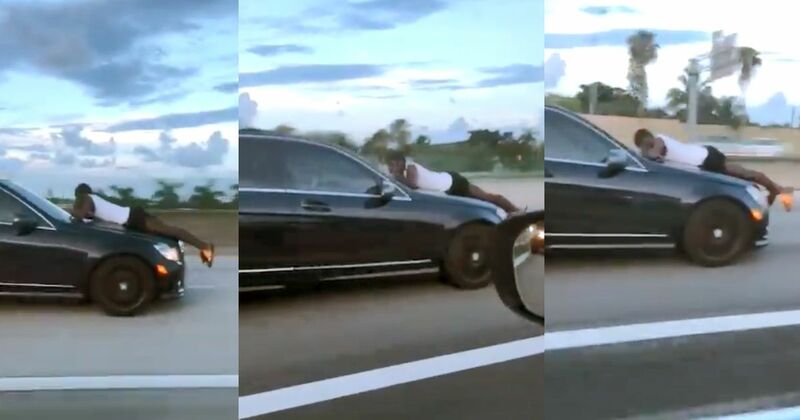 The astonishing footage, filmed on Sunday by a driver in another lane of the Interstate 95 in Miami, has been combined with the audio from the actual 911 emergency call placed by the man in the footage. Junior Francis was clearly visible on the phone while Patresha Isidore drove the Mercedes at high speed, totally heedless of the danger she was putting another human being in. Amazingly, the argument was purely over who got to use the car that day. Follow-up reports in the Miami media suggest that Ms Isidore doesn’t have her own vehicle but had previously had access to Francis’ Mercedes and simply took the car in order to collect the pair’s daughter. Mr Francis jumped onto the bonnet to try to stop her. The 24-year-old woman is quoted by WSVN as saying: “I had to go get my child. I wasn’t going to deal with any foolishness.” Excuse us while we update the definition of ironic in our dictionary.